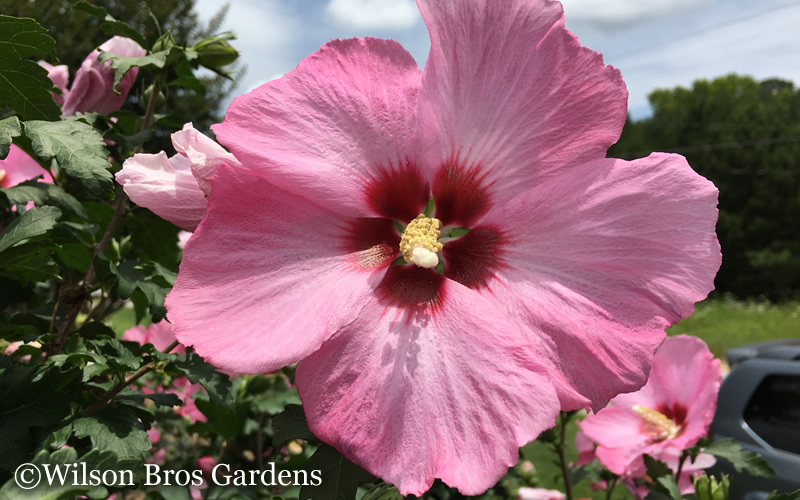 With loads of HUGE flowers up to 6 inches across that resemble tropical Hibiscus, Aphrodite is the best and strongest growing pink flowered Rose of Sharon we've ever grown. That's why it's a personal favorite in our own gardens. Get all the details below! 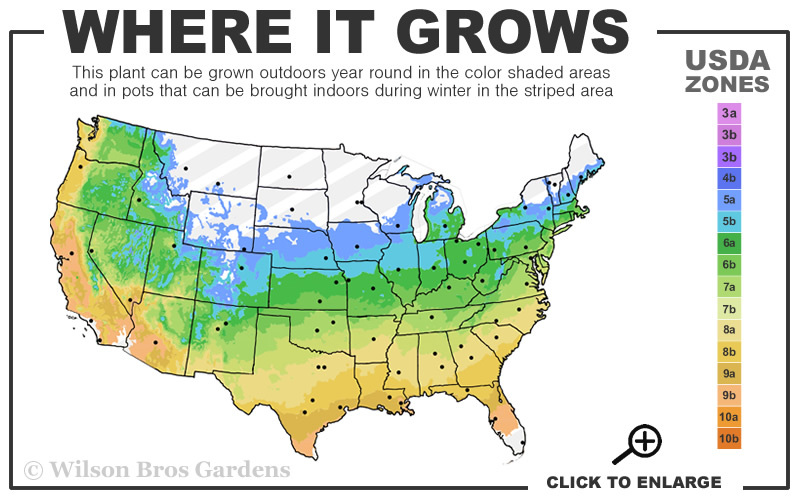 Note: For our customers who live and garden north of USDA Plant Hardiness Zone 5a, where this Rose of Sharon variety is not reliably winter hardy, you'll be happy to know it can be grown in containers that can be brought indoors during winter and placed back outside when temperatures warm up in spring. 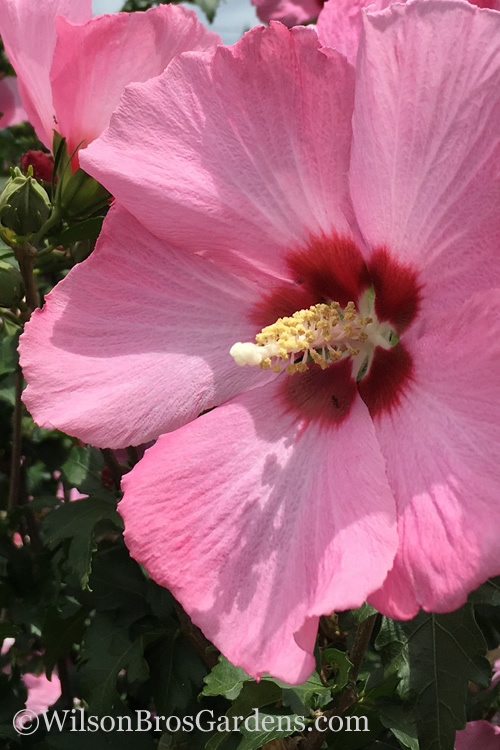 With loads of HUGE flowers up to 6 inches across that resemble tropical Hibiscus, Aphrodite is the best and strongest growing pink flowered Rose of Sharon we've ever grown. That's why it's a personal favorite in our own gardens. The abundance of flowers produced in summer is truly stunning and butterflies and hummingbirds flock to them. Extremely heat and cold hardy. No need to worry about seedlings or sprouts coming up from the roots as we haven't seen this bothersome trait on this variety. 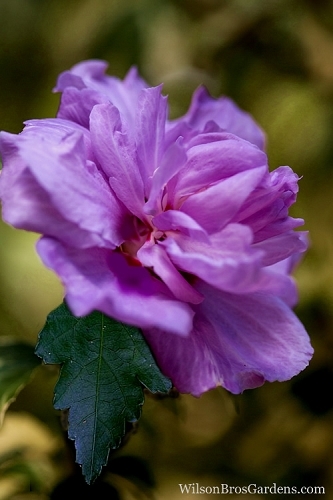 Growing 8 to 10 feet tall and 6 to 8 feet wide, the Aphrodite Rose of Sharon is ideal for use as a specimen, in groupings or in staggered or straight rows as a colorful hedge in landscape borders. 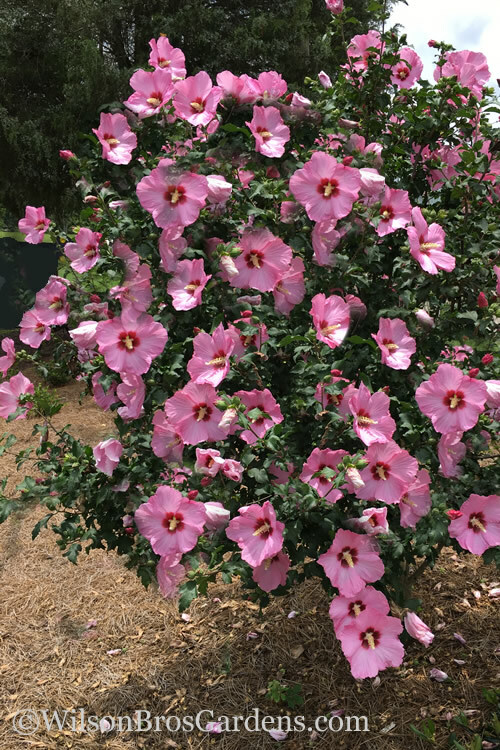 As this rose of sharon grows taller lower branches can be removed to form a highly attractive small tree useful for a focal point specimen or accent in home foundation plantings, around patios, decks and other outdoor living spaces, or just about anywhere in the sunny landscape. A fine addition to pink theme gardens, cottage gardens, tropical look gardens, and butterfly and hummingbird gardens. 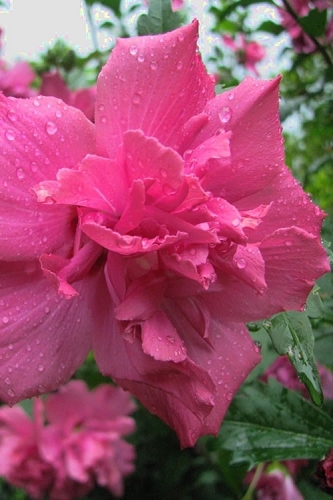 Rose of Sharon are easy to grow and maintain in most any moist but well-drained soil of average fertility and plenty of sunshine. 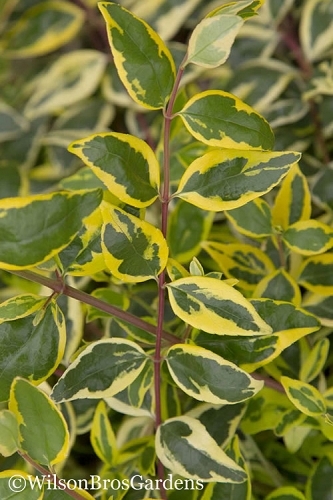 Some shade will be tolerated but flowering won't be as heavy and plants may be leggier and tend to flop with too much shade. 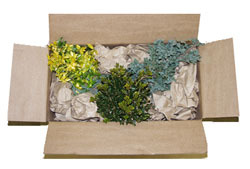 Maintenance is minimal requiring little or no pruning and plants are quite drought tolerant when established. 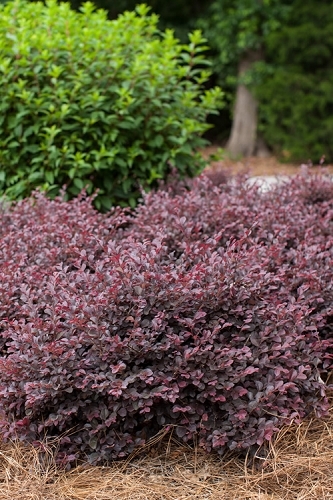 Click on the link below to find helpful advice from our experts on how to plant, prune, fertilize and water Rose of Sharon. My rose of sharon arrived with no damage at all. I was surprised at the large size and can't wait to see the flowers this summer. 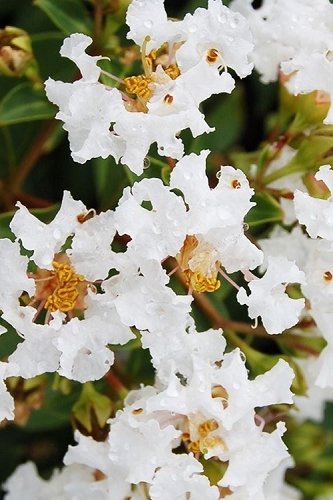 A friend of mine in Georgia has one of these and it's absolutely beautiful with loads of flowers in the summer.